Traumatic injuries are the leading cause of death of individuals between the ages of 1 and 44 in the USA with both blunt thorax and abdominal trauma causing significant morbidity and mortality. Appropriate utilization of imaging is essential to the management of trauma. Understanding both the initial and secondary imaging modalities of choice based on the trauma severity, location of injury, and clinical condition is important. Initial imaging must allow for rapid identification of life-threatening injuries, as rapid stabilization in the initial hours after injury is essential. Secondary imaging then provides a detailed evaluation of all injuries potentially affecting patient outcomes. This chapter is an evidence-based review of the appropriate imaging for patients with blunt thoracic and abdominal trauma. The authors would like to acknowledge the work of Dr. Frederick A. Mann. 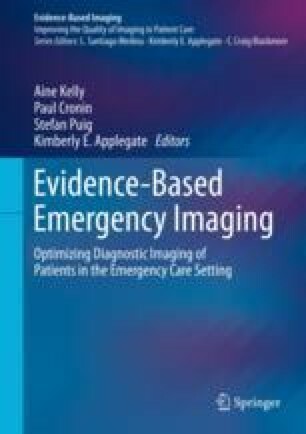 This current chapter represents updates of his chapter (Blunt Injuries to the Thorax and Abdomen in Medina LS et al., eds: Evidence-Based Imaging: Improving the Quality of Imaging in Patient Care. NY: Springer Science; 2011), incorporating the most current evidence.